We had a great ride out to Cold Springs in Blue Bird weather. Starting out we had 15 riders, but some split off to play in the steep & deep. As always the food was great at the crock luck after the ride. Thanks Chris for the pictures. I’m sorry a missed a day with good friends. 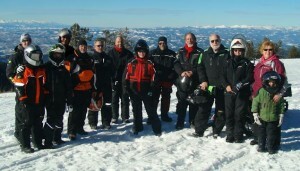 It looks like it was a sunny day & folks had fun even if the snow wasn’t great.